When a given genre or medium becomes dominated by two major players with opposing approaches, it can be very difficult for a new, alternative talent to muscle in and take some of the glory. Film fans can be a tribal and contradictory bunch: we demand the moon on a stick in terms of innovation, and yet complain when a given director or studio doesn’t meet their usual standards (i.e. producing the same thing over and over again). The increasing conservatism of Hollywood compounds this problem; there’s no shortage of formulaic work out there, and truly novel films struggle to fight for their share of the oxygen of publicity. Since the late-1990s, mainstream animation in the west has been divided into two camps: PIXAR, which believes in making films which all the family can enjoy on the same level, and Dreamworks, whose films have one set of jokes for children and another set for adults. 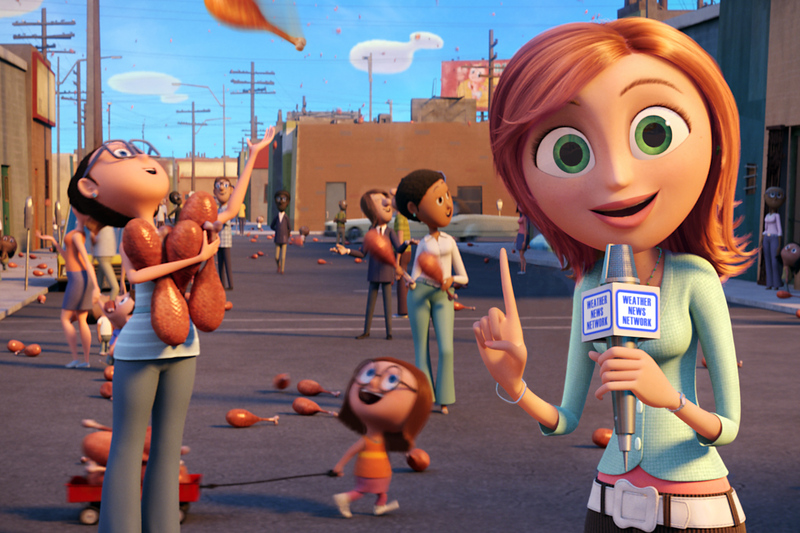 Cloudy with a Chance of Meatballs (Cloudy hereafter) falls somewhere between the two approaches; it’s replete with references to other films and is as bombastic and hyperactive as Dreamworks, but it can also be enjoyed by people of all ages and keeps its relationships at the heart of the action. Most of all, it’s one of the strangest and best children’s films of its time, oozing with visual imagination and possessing a welcomely surreal sensibility. Mark Kermode described the film as “the kind of kids' movie David Lynch would have made had he not been so busy fooling around with the animated segments of Eraserhead.” It’s hard to think of another mainstream animated film of this period (besides Coraline, at least) which has been this confident in filling its screen with uneasy or pleasantly disturbing imagery. It’s not just the walking chickens which feel eerie or off-kiltre: whether it’s the slow-motion of Flint falling in love, the Mayor’s balloon-like physique and “choice” speech, or even the stretchiness of the characters, almost everything in the film has an uncanny, strange quality which helps to make it distinctive. Even in the moments which are unsettling, the boldness of its visual decisions keeps you hooked in. Aside from setting itself apart visually, this bizarre sensibility (which owes a certain amount to Yellow Submarine) helps to lift the film both as a comedy and as a story about family. 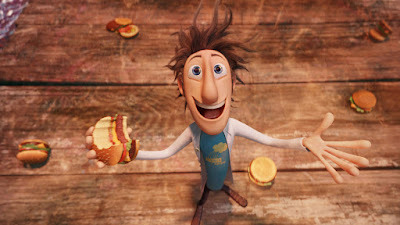 We’ve become used to animated films which fling their characters around for the sake of quick and easy laughs, but throw in a monkey with a speech translator and giant food and it all feels fresh again. Equally, we’ve grown used to dramas about a son trying to make his parents proud while rebelling against what they want for him. Flint’s inventions turn his big dreams and well-meaning but misplaced ambitions into a terrifying reality; we share in his frustrations as his father fails to appreciate him, but also sympathise with the latter as the speed of change causes a communication barrier. The ending may be sentimental, but it earns the right to do that with a combination of well-built spectacle and sufficient quiet periods for the characters to develop and interact. Like many great children’s films, Cloudy is both a celebration of the imagination and a cautionary tale about responsibility. Flint is unquestionably a bright and imaginative individual, but his greatest flaw is not thinking through the implications of his inventions – he invents spray-on shoes but it never occurred to him that he might someday want to take them off. His father has the opposite problem, being so conservative and worn down by the tedious realities of small town life that he lacks any imagination or creativity of his own. The arcs the characters undergo may not be the most ground-breaking in cinema, but their development is believable and there’s plenty of hilarity involving both of them to see us through. In light of its eerie sensibility and characters who indulge themselves in unhealthy food, the film merits a comparison to Tim Burton’s Charlie and theChocolate Factory. Burton’s interest in all that is Gothic and grotesque was an excellent means of bringing out Roald Dahl’s dislike of excess and greed which permeates the original novel – by serving up a collection of warped and exaggerated characters, Charlie’s genuine joy and sense of wonder shines through. 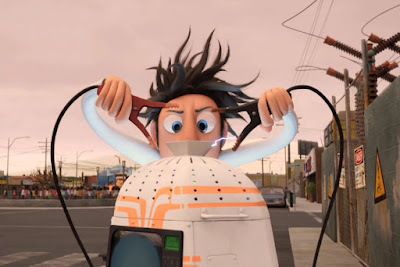 Phil Lord and Christopher Miller employ a similar technique here, as Flint’s animation becomes more naturalistic and under-stated as the world goes weirder and around him. Both films also depart from their source material in a largely beneficial way; for all the merits of the original children’s book (published in the late-1970s), this is a more coherent and enjoyable tale with a more solid narrative. One of the big complaints about Dreamworks films – and especially the later Shreks – is the abundance of references to more adult films and media which will go over the heads of much of the target audience. This isn’t an exclusively Dreamworks issue (Disney did it with Aladdin, for instance), and it’s quite understandable for creative people who are devoted to cinematic storytelling to want to pay tribute to those who came before. But it becomes a problem when whole sequences are shaped around the reference or pop culture joke – the princess fight in Shrek the Third feels like it only exists because someone really liked Led Zeppelin’s ‘Immigrant Song’, not because that was what the film really needed at that point. The nice thing about Cloudy from this perspective is that it manages to be surprisingly cine-literate in a way which doesn’t disrupt or overshadow the plot. If you know your cinema it won’t take you long to spot all the films to which it tips its hat – the ship flying away as the machine explodes is the climax of Return of the Jedi, the monkey ripping out the gummy bear’s heart is from Indiana Jones and the Temple of Doom, the shots of Flint standing in the rain of food with his arms aloft is a neat riff on The Shawshank Redemption, and of course Eraserhead hangs over the whole thing, as we’ve established. Lord and Miller have described the film as a homage to disaster movies, citing as inspiration Twister, Armageddon, The Core and The Day After Tomorrow. Twister is the most clearly referenced on a visual level, while Armageddon and The Core’s contribution lies in the mission to stop the machine, and the (un)natural disasters that spread all over the world are a delightful take-off of Roland Emmerich’s work. But even if you don’t pick up on any or all of these little moments, the film still clicks and runs beautifully; you certainly don’t feel like the film is being held up by these moments, and it still feels like its own beast rather than just a parade of knowing nods to other people’s work. Cloudy’s irresistible energy is sustained by a very capable voice cast, many of whom are surprisingly good compared to their other output around this time. Anna Faris is a lot of fun and very charming, to the extent that her performance here is almost enough to redeem her appearances in The House Bunny or Just Friends. Bill Hader’s output is very inconsistent, but here he’s firing on all cylinders, being funny and endearing without either emotion coming across as forced. James Caan is an excellent choice as Flint’s father – it’s among the better performances in his late-period roster of grumpy or cantankerous characters. And Bruce Campbell’s Mayor is a real highlight, with the actor bringing subtle threat to his performance as the plot develops and the character’s waistline bulges. The only real flaw with Cloudy, like many films of the period, is the 3D. When a film has this much eye-popping spectacle (not to mention Mr T’s character bouncing all over the place whenever anything goes wrong), we don’t need things endlessly coming out of the screen at us to keep us engaged or interested. 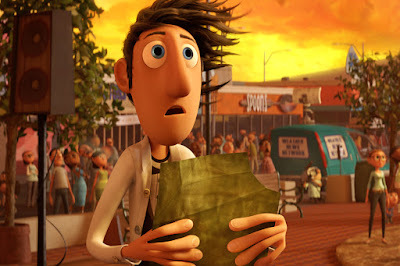 In this regard the film falls between two stalls; the 3D doesn’t feel essential as we are led to assume it was in Avatar, but neither does it completely function without it in the way that Coraline managed – it has the tell-tale sign of certain shots being staged simply to utilise the glasses, in a way which instantly dates the film and prevents it from perfectly translating to home media. It’s by no means a deal-breaker, but it is an annoying quibble for an otherwise stunning film. Cloudy with a Chance of Meatballs is a great children’s film which balances its huge and strange spectacle with a good story and a relevant moral. As well as packing a bit more substance than you might expect, its characters are fun and endearing and there are enough unusual or bizarre moments in it to keep you talking afterwards and reward repeat viewings. While Coraline remains the best animated film of 2009, this comes a very close second and is a must-see for fans of animation. For more of my thoughts on Eraserhead, check out The Movie Hour podcast here.